I've Experienced MOMspiration at Discovery Suites and I like it! A long-time reader would probably know by now how close I am with my mom! And that closeness actually changed when I turned into a mom myself! Our relationship is way closer and I really can't thank her enough for all the sacrifices, hardships and adjustments she has done! I mean, I knew that from the start, but experiencing it first-hand is a different story! Less than a week after I gave birth, I gave my mom a call and told her: "Ma, I can't believe how hard it was for you, I only have 1 and you had us 4! THANK YOU and I LOVE YOU!" And let me tell you a bit about my mom, she is really down-to-earth, humble and very simple! She never asks for material things and would feel bad accepting expensive gifts! So for me, the best gift to a mom like that...is the gift of time. As much as I would love to be there for her 24/7, with my very busy schedule, I'm sure just giving her the time she deserves, to feel special, to feel appreciated is the best gift in the world! And recently, I experienced one BEST GIFT idea for moms out there! MOMspiration at Discovery Suites. No joke, I am not paid to write this post, I was just invited to "experience" how it is to enjoy a fun, relaxed lunch with fellow mommies. And I want my mom to enjoy the same experience I had. "MOMspiration" is Discovery Suites' way of honoring our pillar of strength. You can choose intimate lunch or dinner or to "jump up" the total gratification experience, you can go for Staycation package that includes dinner treat like what I experienced. I will share more about the pricing and details below but please, enjoy my photos because I am literally salivating at the moment. My drink of choice: Mango Strawberry Shake. The combination is surprisingly good! On to Appetizer, you may choose between Steak Salad or Seafood Veloute. I gave both a try and my pick is the Seafood Veloute! The best seafood soup I've tried to date and I'm not joking! The Steak Salad is amazing too but if I may have to choose one, I'll give up Steak Salad for this wonderful cream-based soup! Mixed seafood stew with truffle foam with grilled brioche bread. Grilled top blade steak with organic mesclun greens and calamansi vinaigrette. Seriously, with the huge serving of steak, shouldn't this be part of the Main Menu? On to the Mains, you have a choice of Fish or Steak. If you picked Steak as appetizer, feel free to go for lighter main dish such as the Halibut Fish! But since my mouth was salivating for Steak, I will go for the latter. But lucky for me, since it was a press event, I was able to sample 2 dishes! This dish is lightweight and perfect for non-meat-eaters! The taste of fish is refreshing, none of the "fishy" or "frozen" taste. I can't help but go for top view, the dish itself is a work of art! Slow cooked beef cheek with seared foie gras and saute vegetables. According to chef, this was slow-cooked for a good 4 full hours! How tender could a steak go? Super tender and juicy! The meat almost melts in my mouth on every bite! I am in love with the extra Truffle cream and Foie gras combined with steak on every bite is a match made in heaven! This dessert is actually a conversation starter and can actually unleash any "chef" side in you! Funny how we all tried to "reconstruct" the tiramisu in all it's "Tiramisu" glory! We failed because after playing with the "cream", I can't help but take a bite because the "scent" was just calling my name! This dessert isn't too sweet so perfect for those who aren't a fan of extremely rich and sweet desserts. 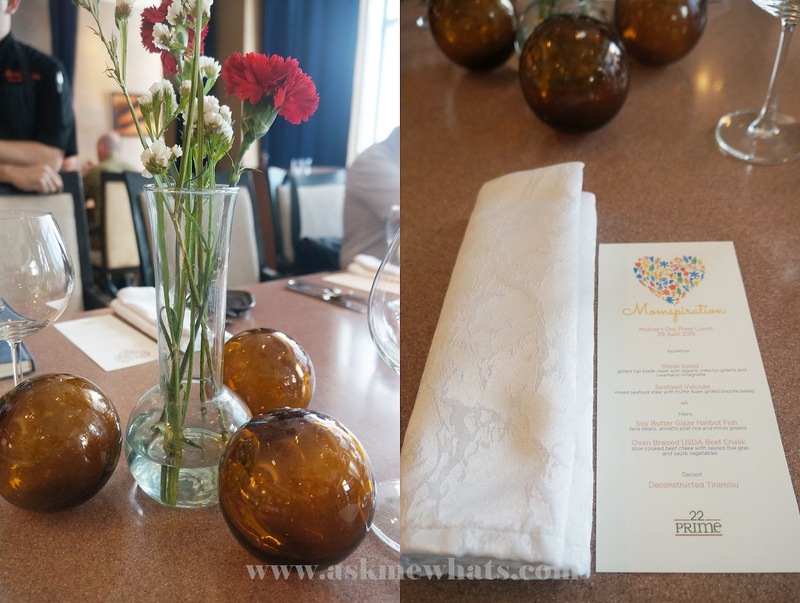 All thanks to Executive Chef Gerwin Bailon for the wonderful MOMspiration meal! He created all the dishes with his own mom in thought and he did a wonderful job! Php7,900.00 nett for Junior Suite with buffet breakfast for 2 persons, 10% dfiscount on food and beverage, movie passes at The Podium Mall cinema, complimentary WIFI to unlimited devices, access to PressReader with more than 3,500 quality online publications and 22 PRime's Mother's Day Special Set Menu for 2 persons. All moms who dine at 22 Prime on Mother's Day will receive a box of pralines! For inquiries and reservations, call Discovery Suites at 719-8888, email rsvn@discovery.com.ph or visit www.discoveryhotels-resorts.com. 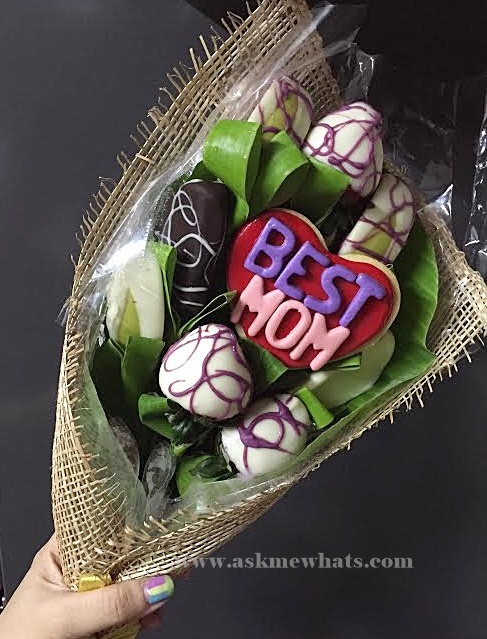 Now, if booking a hotel or going for a lunch/dinner reservation is really impossible for you (especially for those who live far), you can also satisfy your mom's sweet-tooth by sharing her my favorite Chocolates brand to date --- Villa Del Conte! The first time I had these are from a gift for my birthday and I got hooked! For more information, visit http://www.villadelcontecioccolato.com/. OR, if your mom is diabetic like mine! We can still give her some sweets with some health-benefits! Fruits in Bloom Bouquet of Fruits! I recently received this for myself and I can't help but have this "pride" after reading BEST MOM! So I'm sure your moms will appreciate this as much as I do! And taking a bite on each of these chocolate covered fruits are worth it! Not as much sugar as regular chocolates but gives out the sweetest message still! For more information, visit www.fib.com.ph. What are some other options to show your moms how much you love and appreciate them? Advance Happy Mothers' Day to fellow mommies!